Easy Installation – All of Berry Notcher floor models conveniently powered by 110 volt AC (60 Cy.) and will operate with a minimum 1 HP air compressor at 80-120 PSI. 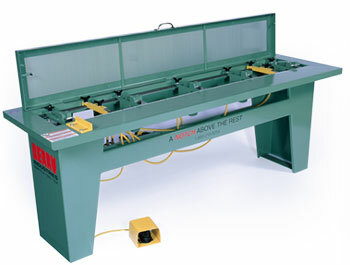 75% Labor Cost Savings – Hand adjustable – no tools needed – so reconfiguration time is minimal. Cycle time is one second! Protective screen prevents injury. The machine operation stops when the screened lid is opened. Steel welded frame for the Berry Notchers (floor model) comes in standard lengths for notching 4', 6', 8' and 10' lengths of material. Attractive, durable powder coat paint finish. Permanent scales for measuring notch spacing and notch depth. Assures accuracy and saves time in both set-up and adjustment. 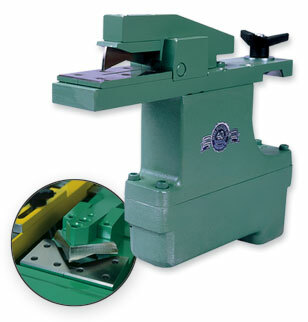 Easy foot-pedal operation leaves operator’s hands free to handle material, permitting single-operator notching. Foot pedal activates pneumatic operating mechanism. Cycle time is one second. 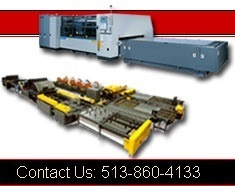 Contact Us | Site Map | ©2004 Cincinnati Precision Machinery, Inc. All rights reserved.